...so opens Chapter Two of F. Scott Fitzgerald's 'The Great Gatsby', and over the following few pages we get the greatest party scene ever published. 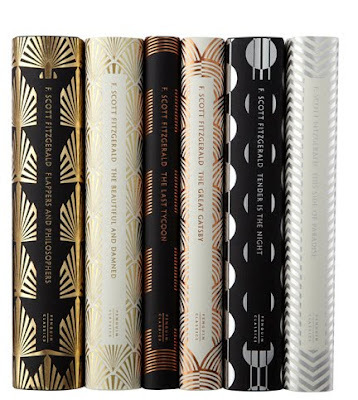 And earlier this month, on the 7oth anniversary of Fitzgerald's death at just 44, Penguin released his key works in a series of elegant new covers by Coralie Bickford-Smith. Bickford-Smith is a senior cover designer at Penguin Books, studied typography at Reading university and currently teaches at London College of Communication. Her website features the full set of covers in a nice horizontally scrolling webpage. 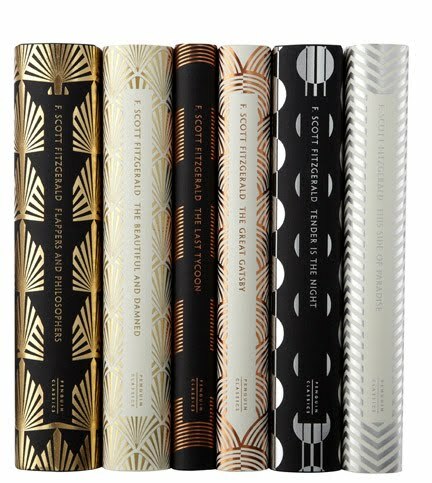 Her designs use a transitional serif typeface and pleasing geometric patterns to produce a languid Art Deco look that perfectly fits the mood of Fitzgerald's ragged visions of late 1920's East Coast America. At same time it has the contemporary simplicity we tend to admire - the music of design, one might say. Penguin have really been pushing the revival in interest in book cover design - they recently issued new cover designs as part of a series of classics by the likes of Dickens, Dostoyevsky and Zola for the (RED) campaign, and one of the D&AD briefs for the 2010 Awards was to create cover designs for a set of H.G. Wells novels.